WHY do you want to contest next year's gubernatorial election in Imo State? Well, we are always looking for opportunities to better the lives of the people and being the governor of the state will create a unique opportunity for anybody who is involved in the race. Every society in Nigeria, in every state wants to get the full benefits of the dividends of democracy. They want to be able to achieve greater prosperity for their people, they want the youths of the state to be able to find work, they want the women, children and everybody in the state to benefit optimally from the dividends of democracy. So I am in the race because I believe that I can do much better with the resources that are available. Since 1999, since the transition from military to civil democracy, I rather suspect that there has been deficit in terms of the result that has been achieved in terms of infrastructural development and a lot more could have been achieved if there was effective use of the resources that were made available to the state. They said there had been success recorded in the past, but I believe that a lot more could have been done and so we do not want to be in a situation in the future where through non-participation in the political process people who are not adequately experienced, people who do not have adequate exposure, people who do not have the necessary capacity to better manage the economy of the state happen to find themselves in office. So your plan for the models of development is one of the factors that made you decamp from PDP to APGA? Well, in Nigerian we have different political parties, but how different are these political parties in terms of ideologies? The PDP is big party so it has a very long structure in terms of when instructions are passed down the line. The APGA is not really as big as the PDP. The difference for mine is that within a party like the APGA, when policies and decisions are made, it gets quickly to the grassroots. Am also attracted by the philosophy of APGA which has the Igbo flavour in terms of the origins. Even though its manifesto accords to a great extent, the aspiration of a better life for our people. I think APGA gives me a better platform to pursue my aspiration to become a governor. 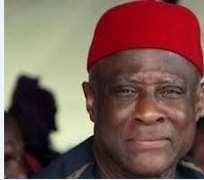 Are you working together with Chief Martin Agbaso regarding your governorship ambition, given that he is the APGA leader in Imo state? Chief Martin Agbaso has his job to do and I also have mine to do. I have just joined the party and I didn't join to vie for the leadership of the party-APGA. I don't think I recall where there is a leader in the constitution and why I should be contesting with those that were in the party before me. I don't have any issue with Chief Martin Agbaso. I have joined the party which will give me a platform to serve the people. What makes you think you are well suited for the job? When I was very young I had an uncle and he was a bit of an academic and he read a lot and had lots of books. And I always used to visit his house and borrow his books that I would read. I was very young at that time. I can't quite remember what age that I was but I had started reading. They were not only the books I borrowed but I discovered that a man is as he thinks. So basically whatever you become in future is what you think you are going to be. So if you have it in mind that you are going to be a successful person, it shapes the way your life goes and eventually you will be a successful person.